I have always been obsessed with tea. I can remember the large samovars that we had in Ukraine. My family would set up the whole thing on the table after dinner. In case you haven’t heard of them before they are a large heated metal vase looking container that is traditionally used to boil water for tea around countries such as Russia and in Eastern Europe. I can’t say I remember what we ate that much, I only have quick brisk visions of picking berries and green apples from our country house. I would say most of the memories of food come from much later on in life, already when we moved to Australia. But I surely remember these tea moments. I loved to watch the table being set up for tea. The beautiful antique samovar would be placed in the centre of the table, the tea cups would be spread around, a little plate of sugar cubes would sit next to the Samovar and the smell of deep dark tea would fill the air. I think that tea drinking became embedded in my memory, the whole process of it all. It truly is a little ceremony that is calming. Perhaps thats why I love tea so much, I only recently started drinking coffee, prior to which I would drink 5 cups of different teas daily! A black or green tea in the morning, followed by rosehip tea, a few other mixtures of herbal teas, perhaps even a spiced tea, and then finally a relaxing chamomile tea. That was actually a lot of tea now that I think about it! I definitely don’t have 5 cups a day any more. I mostly stick to one type of tea a day and recently fell in love with rose petal tea. So simple but the aroma and flavour is incredible. 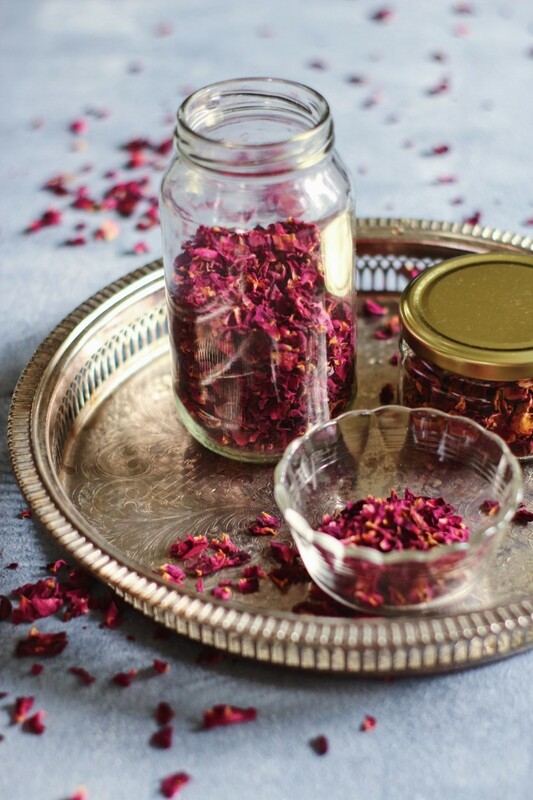 Before I even pour the boiling water into the tea pot and just place a spoonful of dry rose petals into the pot the aroma fills the air. I guess no one needs a recipe for making tea unless it has to be prepared in some unique way, but I still wanted to write about it just because I think the ceremony of it is quite special. So here are just plenty of pretty pictures of the rose petal tea that I am enjoying every day this week! I hope you try it too. You can get it in most health and tea stores these days – but this one if from The Tea Centre.